I’m so pleased to be the host for Mailbox Monday during the month of June. After this week, I will be in northern Wisconsin for two weeks, and I’m not quite sure how the wi-fi connection will work from our little cottage. However, I have scheduled the posts to go up, and at least you will have a central gathering place from which to leave your links. So, here’s to a very happy June together! Fair Dalliance: Fifteen Stories by Yoshiyuki Junnosuke: “Yoshiyuki Junnosuke was a sensual writer, whose style is reminiscent of that of novelists such as Tanizaki Jun’ichiro and Nagai Kafu. His works deal with the possibility of emotional purity in the relationships between men and women. Often, the relationship is examined through the agency of the protagonist’s association with prostitutes. This collection brings together a selection of many of his finest stories, examining human relationships to reveal new aspects of ourselves. 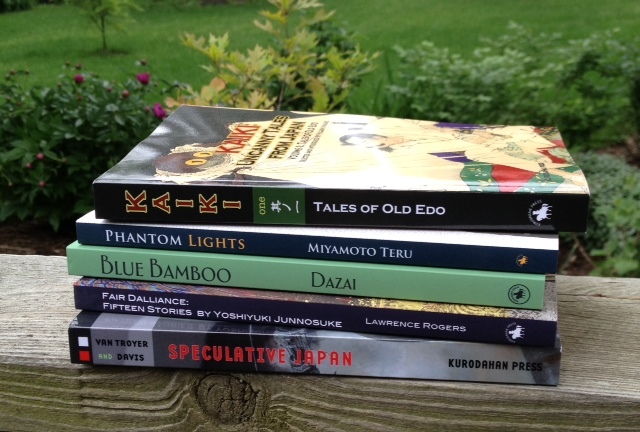 Previous Post The Japanese Literature Challenge 7 Begins! The contents of my mailbox are never as interesting! 🙂 I hope you have a wonderful break! Someow, I seem to have been put on Penuin's list. I feel very lucky, believe me, to receive some the latest releases. I do love these thriller sorts! Very interesting mailbox, all of that Japanese lit looks like fun to explore! I live in Northern WI! I hope we have good weather while you're in the area. It's chilly/rainy this morning, boo! I sometimes let my books accumulate, too. But then it makes for a lovely Mailbox post when they do all come together! Looking forward to seeing what you received, Diane. It could rain every day in WI, and I would still be happy. I love that state! I will investigate for sure. Even though I've sworn off any more challenges, lol. I hope you have a great time on vacation. I love this state too 😉 Would it be creepy of me to ask what town you'll be visiting? LOL, hope not! Fair Dalliance looks especially good to me. Thank you for hosting this month! These are all new to me, but I hope you enjoy them! And thanks for hosting this month! Bellezza, I think you will enjoy being the host of Mailbox Monday very much. I was the host during the holidays, and although it was (and always is) a busy time of year, I truly enjoyed hosting this fun and friendly meme. Your new books (photographed so beautifully!) are tempting me as well. An abundance of riches here! Duly noted, and I'm sorry my reply above was so full of errors. Guess who was typing while not fully awake yet?! Fair Dalliance looks good to me, too. Well, I guess I'd have to say that about practically any work of Japanese literature! Thanks for linking here, Mary. Thanks for reading the post and linking to yours, Shoshanah. bellezza, thanks for hosting Mailbox Monday this month. I've now discovered another wonderful blog. I've joined (I think I did it right) the Japanese lit challenge and am looking forward to it. I am having trouble however, getting mr. Linky to recognize my Mailbox Monday link. can you check when you get a chance? Happy reading all those great new books. Thanks for hosting MM. Enjoy your books! I think I will enjoy it, too. I only wish I wasn't going to go e for half of June! Hope that doesn't make things too difficult for the Mailbox Monday participants! Glad you like the photographs; it's easy to ate pretty pictures in June. What a lovely stack of books! I'm curious about A Serpent's Tooth. Thank you for taking on the hosting of Mailbox Monday for the next few weeks, it is good to 'meet' you and I do hope that you manage to keep in touch, despite being out of town. Jussi Adler-Olsen, is a new name to me among the emerging Nordic writers and this series sounds excellent. I am still trying to work out whether the individual books work as stand alone stories, or whether I need to amass all the previous books in the series, before I start reading. I have never read any Japanese literature, however some of your new book selection had me very intrigued. I have marked 'Tales Of Old Edo', as a book which is likely to give me the best overall taste of Japanese writing, as a starting point for my journey. I hope that you enjoy all your new finds this week. They all look good! Especially that A Conspiracy of Faith book. I'm adding several of these to my wish list. Thanks for hosting in June! Thank you for hosting! I am drooling over all those Japanese books – will definitely be joining you in this year's challenge. Have heard of Jussi Alder-Olsen, but not read anything yet. There is a bookseller in Melbourne that loves Nordic fiction and I'm still trying to work through all her recommendations! Thanks for hosting MM this month! I have Conspiracy of Faith too but first I need to catch up with the first book 🙂 Happy reading and enjoy your vacation! I wanna get hold of the Japanese Literature! Also The Serpent Tooth interests me! I haven't read too much Japanese literature, but just looking at your new books makes me want to try it more often. I have too much on my plate right now to join your Japanese Reading Challenge but I'll look out for your reviews. Loving the look of all those thrillers – enjoy! Wow, lots of good ones. Thanks for hosting this month!! Only a few of those books are familiar to me. I am always impressed by the Japanese literature you read! Have a great vacation and enjoy your new reads! They look like a great mix! 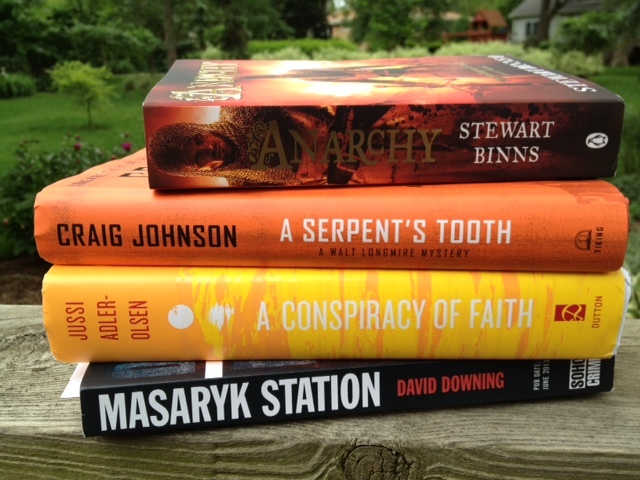 All of your top reads look SO exciting, especially Anarchy! My daughter is also a HUGE fan of Japanese literature, and she would positively drool at your bottom reads! Thanks for hosting and have a great vacay! You have an interesting variety of reads. I really need to start reading Craig Johnson. I live in Wyoming, and many of my book club friends are big fans. I'm behind I guess. Nice assortment. I have A Conspiracy of Faith in audio but your others are new titles for me. Enjoy your books – and the time at the cottage. Very interesting selection! I have the first of Jussi Adler-Olsen's series in French translation, but haven't read it yet. I love how different the English covers have been! David Downing's latest looks good, but so too do the Japanese books. Thanks for hosting. I have loved the other dept. Q books by Jussi Adler-Olsen, so I have to check this one out. Thank you for hosting. You've got an amazing mailbox. Enjoy. The David Downing book looks really good. Enjoy your vacation, and happy reading! woot! That's a lot of good books. I got the Jussi Adler-Olsen book and am excited about that one. Enjoy your vacation! 2 weeks in a cottage in northern Wisconsin? How lovely, dear Bellezza. I'm sure it's a perfect retreat for your first days of summer. I was in Oregon for a week and next week we head to the Seattle/Kingston area. Looking forward to being near the water again. Enjoy your vacation. And all those lovely books! Oh, wow, 2 weeks in Wisconsin sounds heavenly! I hope you have as marvelous a time as I'm visualizing. I was going to tell you Simon Van Booy is dropping by Chicago on the 15th of June, but sadly it looks like you won't be able to see him. Enjoy your vacation!